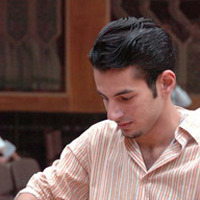 GM Ahmed Adly won once again the Egyptian chess championship and was crowned champion of Egypt for 2009. In the presence of 3 GMs, 5 IMs, and two more players, the world junior champion Ahmed Adly did not lose a single game during the event. He completed a total of 5 victories and 4 draws to finish with 7,0/9, a full point ahead of the competition. The silver medal was for IM Mohamed Ezat who recovered after a first round loss to Adly and played very strong chess during the event. Third place with the same points, but worse tiebreak score was for GM Amin Bassem. Here are all the standings and results.